Hi everyone! After our last interview with Carlos Longarela, today we’re sharing an interview with someone who’s not a Spaniard. Kasia Janoska is a front-end developer at OnTheGoSystems. 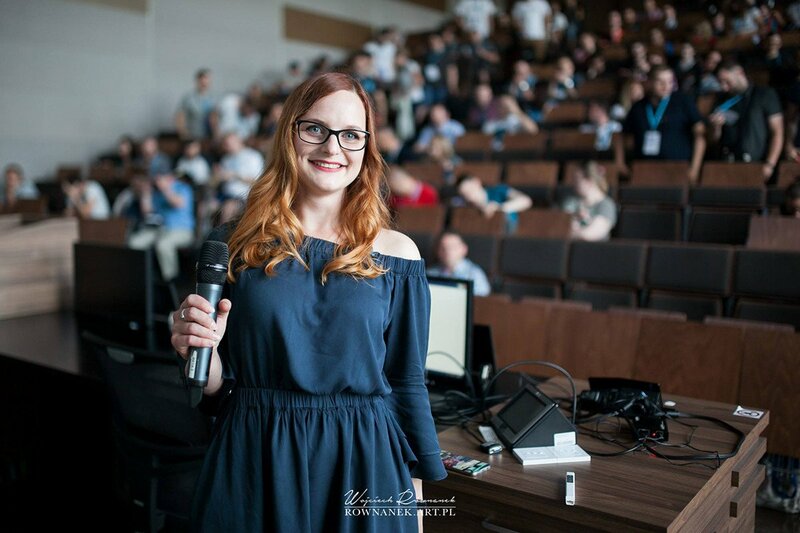 She’s a WordPress enthusiast and a regular speaker and attendee at many WordCamps in Poland. Let’s give Kasia a warm welcome! Thanks for being here, Kasia. I’m really excited to talk to one of the developers at OnTheGoSystems, the creators of the well-known WPML plugin. For those who don’t know you, please tell us a little bit about you, your career, and your relation with WordPress. Hi David, I am really excited to be here. Thank you for the invitation. I am a front-end developer with a great passion for UX. I built my first simple website when I was 13 and since then I knew this was something I wanted to do for a living. Getting to know WordPress in 2011 was a game changer for me, it was love at first sight! I started working at OnTheGoSystems only few years later and I am super happy here. I can combine my passion for front-end and UX while working on WPML and Toolset plugins development and, since we all work remotely, I can also travel a lot or just casually change my workplace when the previous one gets boring. When it comes to my relation to WordPress? I of course like working with this CMS and developing plugins, but what I admire the most is the WordPress community. I haven’t missed any WordCamps in Poland since 2013 and I’ve been a speaker every year since 2014. I am very glad that so many people know me as a Toolset and WPML dev girl who promotes remote work as the best way of working that there is. I really like the idea of working remotely and actually had the chance to do so for a short period of time, when I was living in Boston. I enjoyed the experience, but I felt like some things could have been better. When working from home it’s not always easy to separate “work” from “leisure”, there are more distractions, and one might miss “human contact”, as they’re working alone. What’s your experience in this area? Do you have some tips to overcome the issues I mention? Would you recommend looking for a co-working space? This is a great question! Since I started working at OnTheGoSystems, getting better at working from home became my completely separate point of interest actually. I even have a blog and I recently started a podcast about productivity in remote work and ways of spending time after work so that you keep your work-life balance and build healthy relationships with people outside the Internet. I think the most important advice for every remote worker is: learn how to stop working. For me, starting work in the morning is not hard at all and I actually think I have less distractions at home than I used to have in an office. In my case the problem appears when 6 p.m. comes and I have to close my laptop, leave the half-baked code alone and go somewhere else knowing that the job is not 100% completed. I think it is much easier in a regular office. You can clearly see that most of your company has already gone home and you do not want to be the only one left in the office. Loneliness can be a problem for remote workers. I think the best way to combat loneliness and working too much overtime, is to take up a new hobby that involves other people and regularly attend interesting meetups. I met some of my best friends during Geocaching and WordPress meetups. For me, arranging to see friends just after work is the best way of leaving work on time and preventing loneliness. I tried working in a coworking place, but I think this is not for me. I can focus much better when I am alone. I think building meaningful relationships with fewer people is much more satisfying and fulfilling my social needs, than just meeting random people in a coworking space, but I know there are people who have the exact opposite needs to mine so I believe everyone should test for themselves. My previous question was about working remotely from the employee perspective, but what about the employer perspective? In Spain there’s this mantra “the more time you’re in the office, the better”, and many, many employers feel like their employees must be in the office or else they won’t be as productive as they could be. How would you convince someone who feels this way and thinks that working remotely is not an option? I think it is worth taking a moment to ask yourself a very important question: are you REALLY able to look at your workers all the time and see if they are actually working or just passing the time by looking at internet and social media? Trust, good communication, and partnership are important in every company no matter if the employees work from an office or if they work from home (whatever country that may be) far away from the employer. Now, let’s talk about your work at OnTheGoSystems. You work as a front-end developer. I find it difficult to create intuitive interfaces… Are there any tips you can give us to create better products? How do you approach this subject? Do you run usability tests with real users? OnTheGoSystems is a big company that hires people with various scopes of expertise. For me, as an employee, this is a very comfortable situation because we work in teams and we can share our knowledge and each of us can do what they like and know the best. When it comes to interfaces, besides UX Expert, UI designer, front-end developers and copywriter, we also have our fantastic supporters, who have the closest contact with our clients. They are happy to share their insights with developer teams. Every supporter at OnTheGoSystems knows that helping people is not only fixing bugs or solving issues ad-hoc, but also making sure that our products are better with every release. In UX it is super important to always listen to the users and, as Steve Krug once said: “do not make them think.” If users do not know what to do or have to think to hard about some part of the interface, this means we did something wrong and we have to take another look. How do we know how people use our products? We not only listen to our supporters, but also organize online meetings with our clients. Some of these meetings are simply to share some thoughts during an ordinary talk, but some of the meetings are very structured usability tests on prototypes or ready products that are about to be released. I like it when the meetings are about comparing two or more versions of the interface. This allows us to choose the best solution or combine several ideas into one that performs the best. As a UX expert, what’s your opinion on Gutenberg? Do you think it’s a move in the right direction? Do “blocks” make sense in the web? Are there any flaws that should be addressed? At first I had a hate-love relationship with Gutenberg. I was afraid that Gutenberg would be a heavy page builder “forcing” you to design things on the spot and thus adding a lot of redundant inline CSS code. What happened in reality? I started using Gutenberg as a blogger and I totally fell in love with it. From the user perspective, the experience is smooth and writing blog posts is much easier. Plus, I am not forced to use any custom styling that would be hard to delete in the future. I think that code experts will still be skeptical for a long time, but UX is all about the user, and for the users—the new blocks approach is a better experience than the classic editor. I am very excited about future plugins that will be developed and further enhance the user experience. In the State of the Word 2018, Matt Mullenweg mentioned that they plan to add native multilingual support in WordPress in 2020+. How would this affect WPML? Are you worried about this movement? Will you get involved in this development and see if there’s still room for multilingual plugins in this new scenario? Well… today WordPress doesn’t allow users to build multilingual sites, so plugins like WPML are necessary. WordPress could add this support in many ways, some can be great for our business and some not so good for us. I think we won’t know this until WordPress development team tell us what they actually want to introduce to the core. What we do know is that WPML provides a lot of functionality, which not everyone needs. Almost everyone needs something, it wouldn’t make sense to bundle everything that we have in WPML into WordPress. This would mean more than doubling the size of WordPress, for the benefit of a small group. This is why concept of plugins works so well for WordPress. Everyone can add plugins to get the functionality that they need. If you bundle all popular functionality into WordPress core, it would become huge and bloated. We ask all our interviewees to share an epic fail from the past and what they learned from it. Well, now it’s your turn! Admitting failures is always hard, isn’t it? I think the biggest failure of mine is one project from my very first job. We were this small WordPress company making websites for individual clients. One day, we won a large project for a well known company in the food industry. The design looked awesome, money was great, and the time we had to finish this project was just enough so we could develop the site stress free. It seemed like a dream job. The biggest nightmare of this project was communication. Every time we, (our small company) wanted to question a part of the project, we had to wait days for the answer… The questions always had to be passed via 3 different departments, which in most cases guaranteed a breakdown in communication. For example the graphic designer received completely different questions than I had originally asked. What’s more I could never be sure if the answer I got was from the graphic designer himself or from a project manager who had no idea why I had asked the question in the first place. In the end,we somehow managed to finish the project, but it was way past the deadline, way over budget, and we were all very stressed. What I learned from this experience is that good and direct communication—without going through third parties—is the key to have a successful project that is delivered on time and within budget with happy staff. I really appreciate that I now work in a flat-structured organization. There are no unnecessary layers of communication, if I need any advice or have questions, I can simply go to the right person and ask. This makes my work so much easier! Finally, who should we interview next? Name 3 WProfessionals you’d like to see in our blog in the future and tell us why. Agnieszka Bury. She has a huge talent of finding things that might be problematic to the user and explaining complicated things in a way that a six-year-old would understand. She is a great WordPress expert and Gutenberg specialist. Agnieszka definitely is the kind of person that concrete developers world needs. Ola Gościniak. Her aim is to support women in technology and women who want to learn more about modern technology but may feel intimidated in what is seen by some as a male dominated world. She is a great WordPress advocate among complete beginners. Her insights about WordPress environment are eye opening for developers with years of experience. Jakub Milczarek. He is a UX designer who truly loves WordPress. In an environment that seems to have two fractions: developers and users – UX designers are the key between developers and users. I think it would be great to hear more from his perspective. Thanks for this interview, Kasia—it’s been really, really interesting! I hope you guys enjoyed this interview. See you next month with a new interview!